I usually don’t shop at Sportsgirl. While I certainly do like the accessories, I’ve only ever owned a couple of clothing items/shoes from the store. Sportsgirl is not really consistent with my style, the sizing often runs large and the clothes seem rather overpriced in general. So this piece is somewhat different from what you’d usually expect to find on my wishlist. However, I absolutely love it. I tried it on this week at lunch time and it was so warm and cosy. I adore the printed design and it’s good quality. These types of jumpers are so tempting during the cold weather we are experiencing at the moment. 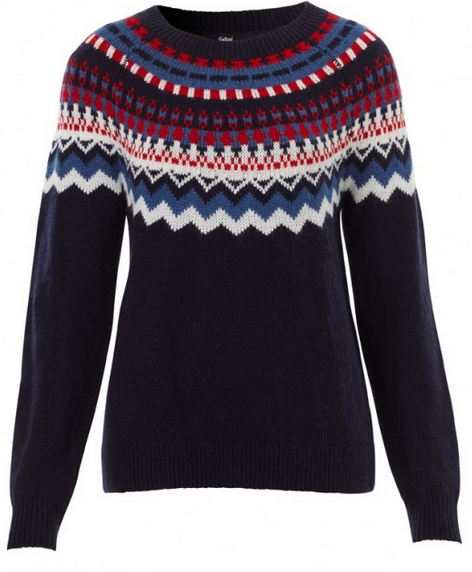 I’m always drawn to a sweet ‘winter’ print such as this; I love my snowflake jumper, bow jumper and red, white & blue jumpers from Dotti which I purchased in previous years. I totally didn’t know that this print has a name- apparently it is called fairisle. I’ve been waiting for the release of this dress after seeing it initially many month ago. It’s so perfect..and so pink! The detailing, black & pink contrast, floral inspiration and fit & flare design is all totally my style. I tried it on the other day. It was much longer than I anticipated. I don’t usually wear anything below knee length. However, this is so long that it is pretty much ballerina length and I actually think that is very pretty and vintage looking. It’s way more expensive that I expected but I do have store credit with Kitten D’Amour so maybe I’ll end up acquiring it. It wouldn’t be particularly versatile as, despite me being overly dressed up for all occasions, this one would have to be reserved for special events. After having not purchased anything from the last couple of Kitten D’Amour collections, the store is now back on my radar. I’m sure that’s partially to do with the fact that the current collection is centered around hot pink. 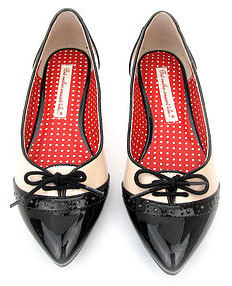 I adore the lace detailing and the bow design. I also love the quality and very fitted structure of tops from Kitten D’Amour. It’s very similar to the lace tops from the ‘Girl Cray’ collection which I purchased late last year and have been my favourite tops ever (green here and red here). 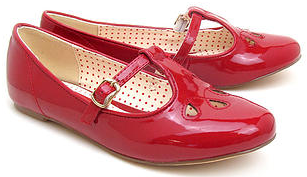 I have these shoes in red (pictured here and here) and they are my favourite shoes I have ever owned. They are perfect and I can’t speak highly enough of them. I adore the lace up inspiration, the vintage vibe and the classy dual colour combination. They go with absolutely everything. I know I’ll get so much use from the black pair, as I have with the red pair, that I believe it’s worth owning both versions. I love Review cardigans; I have them in a couple of different colours but would be so happy to own more colours of the rainbow. I’m very fussy about the quality of cardigans so I usually buy only Review and Alannah Hill; these particular ones are good quality. I often like to customise these cardigans with sparkles, embellishment, buttons and sequins. They are a great basis for a DIY. 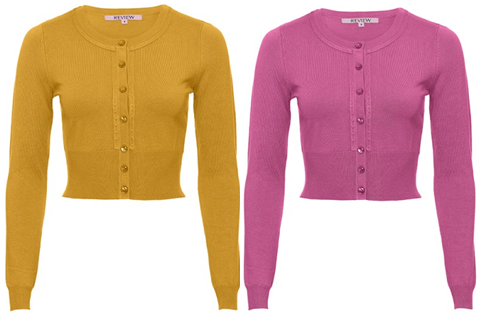 I especially want the mustard shaded cardigan because I’ve wanted a mustard piece for years but haven’t been able to find the right one. This cardigan is certainly the right one as it’s very beautiful. I also adore the pretty shade of pink here. Surprisingly I don’t actually have too many pink cardigans so it would be great to add this one to my collection. I’m waiting for them to come on sale because these cardigans often do eventually. I recently noticed these adorable flats on both the .B.A.I.T Footwear website and Modcloth; I’m not sure if they are a new style. They are the sweetest ever and remind me of shoes I used to wear as a small child especially because of the cut outs. This style also comes in both white and black, in addition to this red patent version. I can’t decide which pair I like the most. Oh, you have to get the mustard cardigan, it would look perfect on you! Those oxford flats are absolutely beautiful! I have a pair in heel form, but would LOVE to invest in a flat pair. So pretty! I love the first sweater!! I love the dress and the first pair of shoes the most! Beautiful items. I like the pair of bow flats! These are some really amazing items dear! Lovely wishlist! Loved the shoes and cardigans! I've been looking for a long time for similar cardis – they'll go perfectly with my flare dresses! pretty lovely collection. the shoes are the best. The black and pink dress is adorable!! You should get it! Oh God I love the shoes and the dress, so beautiful! <3 LOVE IT. I saw a Kitten D'Amour blouse in an op shop the other day and I thought of you! I considered getting it to send to you but I didn't want to get the wrong size. It was only $2 though, maybe I should have just got it…sorry!